The 207th Exhibition of the Royal Institute is currently showing at the Mall Galleries, The Mall, London SW1, from 3-18 April, open 10am to 5pm daily, closing at 5pm on the final day. The RI was formed to exhibit the best watercolours and to show non-members’ works alongside the individual collections by Members, a policy that is upheld today. Works by Candidates seeking membership will also be prominently displayed and this year we set a new record for non-members’ paintings of 38%. 3 April – Bob Rudd RI will be showing his sketchbooks and answering questions about his work and techniques; visitors are invited to have a portfolio review with Ann Blockley RI; Tianya Zhou RI will be painting in the gallery; Naomi Tydeman RI and Lillias August RI will be available to answer visitors’ questions. 4 April – Jean Noble RI SWA will be showing her sketchbooks and answering questions about her work; and visitors are invited to have a portfolio review with Steven Allan Griffiths RI. 5 April – Ian Sidaway RI will be showing his sketchbooks and answering questions about his work and techniques; and Geoffrey Wynne RI will be available to answer visitors’ questions. 6 April – Visitors are invited to bring in a small portfolio of your work for a Critique with Ann Kilvington RI; Rosa Sepple PRI and Jean Robinson RI will available to answer visitors’ questions. 8 April – Roger Dellar RI PS ROI will be demonstrating his watercolour technique in the gallery and answering questions. 9 April – Painters’ Question Time with Rosa Sepple PRI, Shirley Trevena RI, Jean Noble RI SWA and Ian Sidaway RI, answering your questions on everything to do with water media and the Institute at 2.30pm; while Jean Robinson RI is available to answer visitors’ questions all day. 12 April – Christopher Forsey RI will be demonstrating his watercolour techniques in the gallery and answering questions; and Ian Sidaway RI will showing his sketchbooks and answering questions about his work and techniques. 13 April – Paul Banning RI RSMA will be demonstrating their watercolour techniques in the gallery and answering questions; while Rosa Sepple PRI and Jean Robinson RI will available to answer visitors’ questions. 16 April – Painters’ Question Time with Rosa Sepple PRI, Lillias August RI, Jean Noble RI SWA and Ian Sidaway RI and Robin Hazlewood VPRI, answering your questions on everything to do with water media and the Institute at 2.30pm. 17 April – Jean Noble RI SWA will be showing her sketchbooks and answering questions about her work. 18 April – Jean Robinson RI will available to answer visitors’ questions. Also, for the duration of the exhibition, there will be a display of photographs and documents from the extensive RI Archives, which have been gathered together over the last three years and are now housed at the V&A in London. The 2o7th Exhibition of the Royal Institute of Painters in Water Colours also marks the release of a new 170 page hardback book covering the history of the Royal Institute of Painters in Water Colours (RI). 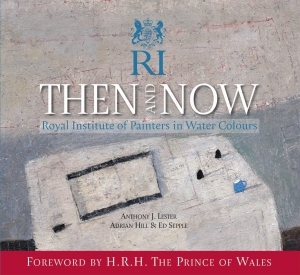 Published by Halsgrove Publishing, the book reveals its unique history, the reasons for its departure from the Society of Painters in Water-Colours, their formation in 1831, the opening of the prestigious gallery in Piccadilly and their rise to become one of the most prestigious art institute’s in the world. ‘Then and Now’ has taken two years to research and compile and is the first book about the Institute and its current Members with a fascinating history written by Anthony J Lester, Hon. RMS, FRBA, FRSA, writer, broadcaster, fine art consultant, curator, collector/researcher on British art. The book contains many historical images from the extensive archives and a list of every Member since its inception. It also features RI members’ biographies written by Adrian Hill, fine art dealer at Adrian Hill Fine Art, with images of current members and examples of their work. The book will be available during the exhibition at the Mall Galleries bookshop, London from 2 April 2019 and is priced at £34.99.